Duh. Week in Dublin was great, but I was up early almost every day. Reloaded with sleep this morning, and followed that up with a nice lie-in. Which ended when I sprang upright, suddenly remembering I had a bus to catch. Got out of bed, dressed, made it to the stop in fifteen minutes flat. When I remembered I’d forgotten my phone. Just as well perhaps. Staying in town gave me a chance to help a friend with a computer problem. But oh… It made me wish I’d caught the bus. This was a sick kitty. about a foot high, covered in the most tacky silver glitter. With a slot on its back. 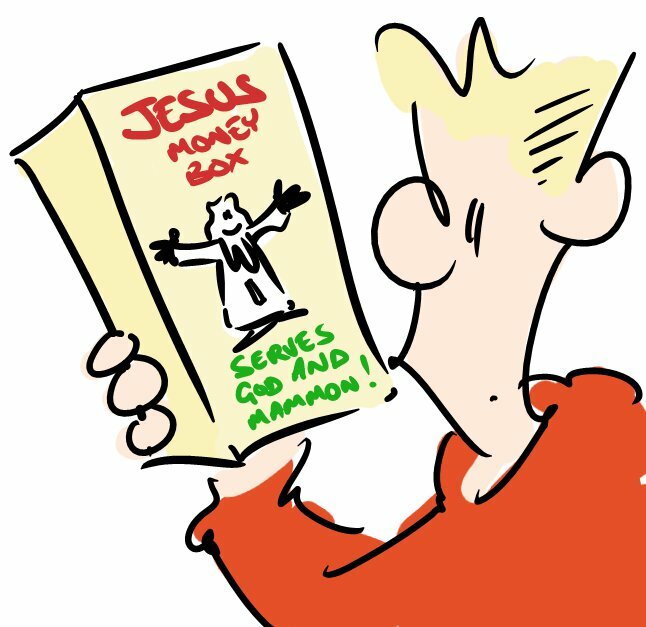 Yes it’s a Jesus money-box. Even as an atheist I find that disturbingly sacrilegious. It’ll have to be used to save for something very special… Any suggestions? And the big news: My girlfriend’s sister just had a baby boy! That makes me a… a… Guy who’s girlfriend is an aunt. Dammit there should be a word for that. I suggest you save up for a subscription to Skeptic magazine. Alternatively, try sticking your fingers in the slot and see if you Believe. I’m thinking of using it to save up for contraceptives. Except, contraceptives aren’t really the sort of thing you want to save up for.